This article will show you how to install Linux Mint 17 side by side with Microsoft Windows 7. The desktop environment that will be installed will be the “Cinnamon Desktop”. It is imperative that you follow every section especially the part about backing up your Microsoft Windows files. If you fail to back up your system and something goes wrong with the installation you run the risk of losing data. Don’t let the last paragraph scare you. 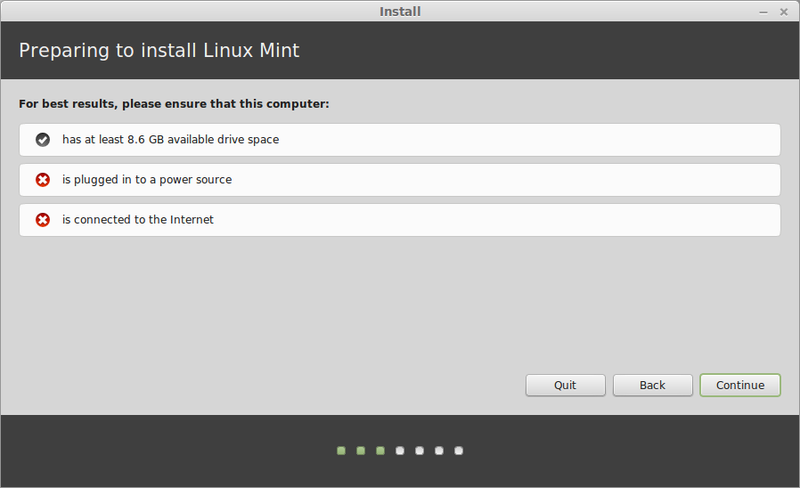 Installing Linux Mint is not that difficult and the rewards are incredible. Linux Mint is currently the most popular version of Linux and boasts an impressive user interface and a great range of software and it can be installed and used for free. Click here if you just want to get rid of Windows 7 and replace it with Linux Mint. Whether you intend to continue installing Linux Mint or not it is very important for you to back up your system regularly. Your computer may well be equipped with the best Antivirus software and the best Firewall software but one careless click on a link in an email could cause Malware to be installed on your computer which may trash your system rendering it useless. Sometimes things go wrong. What would you do if your hard drive failed? First of all you would lose access to Microsoft Windows and more importantly all of your photos, videos, music files and documents would be either lost or very difficult to recover. Before installing Linux Mint it is imperative that you backup Windows 7 in case something goes wrong with the partitioning of the hard drive or the installation of the “GRUB” bootloader which enables your system to dual boot between Microsoft Windows and Linux Mint. 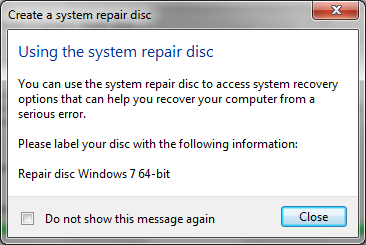 The recovery disk is used when you don’t have access to Windows 7 at all. It provides a way to boot so that you can recover from your system image. In the “View By” drop down in the top right corner select “Large icons”. Click the “Backup and Restore” icon. 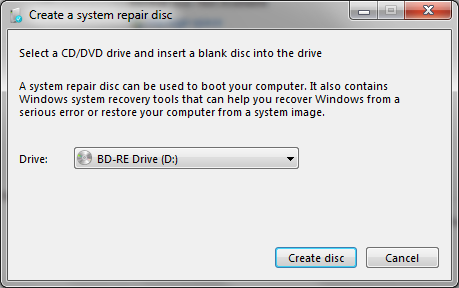 Click “create a system repair disc”. A screen will appear asking you which drive to use to create the disc. Select your DVD writer. After a short period a message will appear telling you to label your disc which is a good idea. Click “Create a system image”. The “Create a system image” dialog will appear and will ask you where you want to create the image. You should choose the location you wish to save the image. Make sure you have enough disk space. 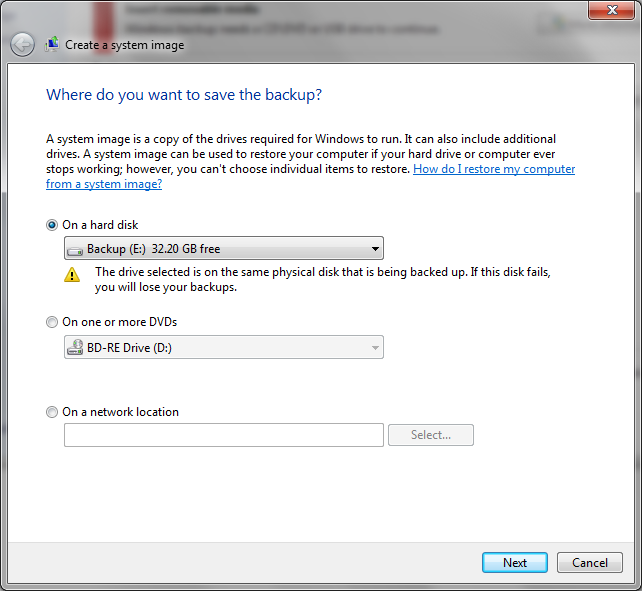 Read the section “Backup Media” if you are unsure where to backup.The options available are “on a hard disk”, “one or more DVDs” or “On a network location”. Once you have chosen where you want to create the image click “Next”. You will now be shown a screen asking you which drives to backup. You should leave the C drive and the System partition checked.You can optionally choose to backup other partitions if you have any.Note that in the screenshot above I have chosen to backup to a different partition on the same machine and I am warned that this is not a good idea. Ideally you should backup to an external hard drive or network drive or at very least DVDs. You will see another screen which asks you to confirm your backup. Click “Start” to backup the image. You should consider backing up important documents and family photos to another device just in case the system image has not been created correctly and the more copies you have of something the less likely it is to be lost forever. Copy the images and documents to a DVD, USB, external hard drive or via a service like dropbox. If you have an iPod synchronise your music so that all your music is both on your computer and on your iPod. Consider backing up your music to a series of DVDs, USB drives or an external hard drive. For videos you will also need to back them up to DVDs, USB drives or an external hard drive. Before continuing it is definitely worth trying your recovery disk out to make sure it loads to the recovery screen. Simply reboot with the DVD in the disc drive. The following is a list of requirements that your computer must meet in order to be able to run Linux Mint with the Cinnamon desktop. This section shows you how to shrink the Windows partition in order to make space for Linux Mint. To be able to shrink the Windows partition you will need to run the “Disk Management” tool.To start the disk management tool click the “Start” button and type “diskmgmt.msc” into the search box and press return. As you can see the my computer has a busy looking disk layout. The operating system is on drive C and is called OS. 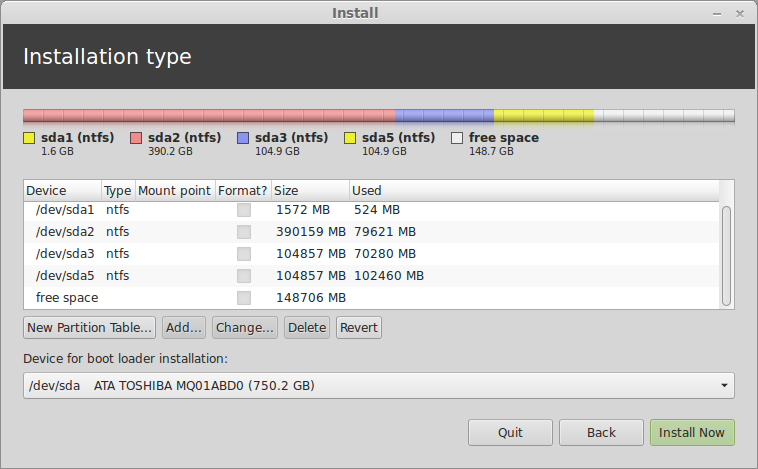 This is the partition that needs to be shrunk in order to make space for Linux Mint. Right clicking on the relevant drive brings up a context menu and on that context menu is the option to “Shrink Volume”. 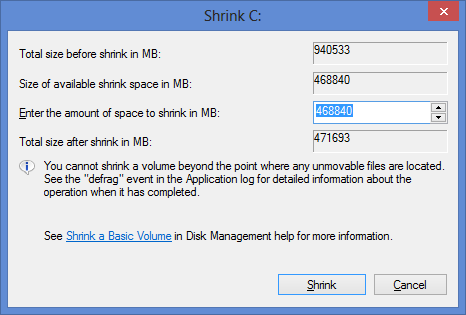 When you click on “Shrink Volume” a box appears asking you how much disk space you want to shrink the disk by. The Shrink utility helpfully sets up the amount of disk space that it can comfortably spare. Unless you have a reason to choose otherwise it is generally fine enough to accept the default options. Click on “Shrink” to start the process. Unlike the backup process this bit is quite quick. If you have a good internet connection, a DVD writer or a USB drive, and you have no download limits on your internet connection then you can get Linux Mint for free. The best place for information on downloading a Linux Mint image is the Linux Mint website. 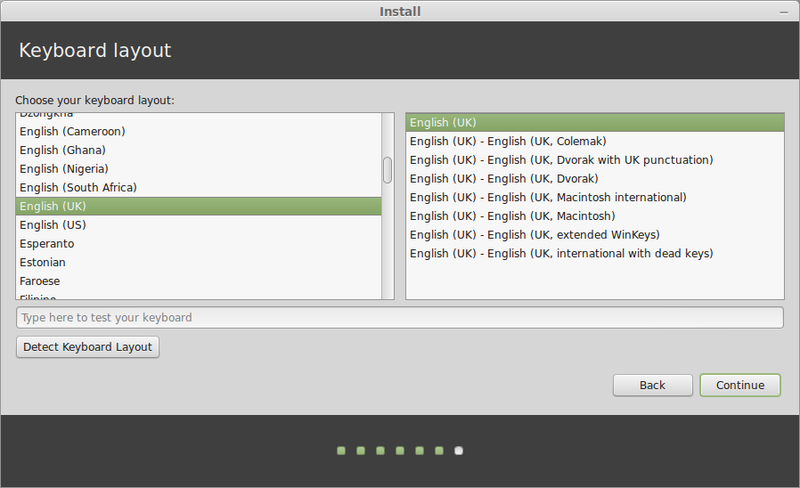 Linux Mint comes in a number of varieties. First of all you can choose to install a 32 bit or 64 bit version of Linux Mint. Obviously you should only choose the 64 bit version if you have a 64 bit computer. You can however choose to install the 32 bit version on a 64 bit computer if you wish to do so. I’m not sure why you would want to do this though. There are also a number of different desktop choices such as MATE, Cinnamon, KDE and Xfce. Ideally you should choose the Cinnamon desktop as this is the ultimate desktop for Linux Mint. It has all the whizzy effects, gestures and style required of a top operating system. If your graphics card is not up to running Linux Mint Cinnamon or you need something a bit more lightweight then you should consider the MATE desktop as an alternative as this will run on pretty much any machine. This guide assumes that if you are running Windows 7 then your computer is probably more than capable of running Linux Mint with the Cinnamon desktop. Another thing you will notice on the download page is the option for no codecs and this goes hand in hand with the “Multimedia Support+” heading. Basically whilst Linux is free some of the components that are installed aren’t. If you want to use Flash or play MP3s then these require non free components to be installed. This doesn’t mean that you have to pay for them but some people would prefer not to have proprietary software installed on their machines. Personally I think it is a good idea to install everything you need to get the job done and in that regard I would choose the option to have multimedia support. As mentioned before this guide is written for Windows 7 and Linux Mint with the Cinnamon Desktop so find that option and click the link (either 32 bit or 64 bit, depending on your machine). 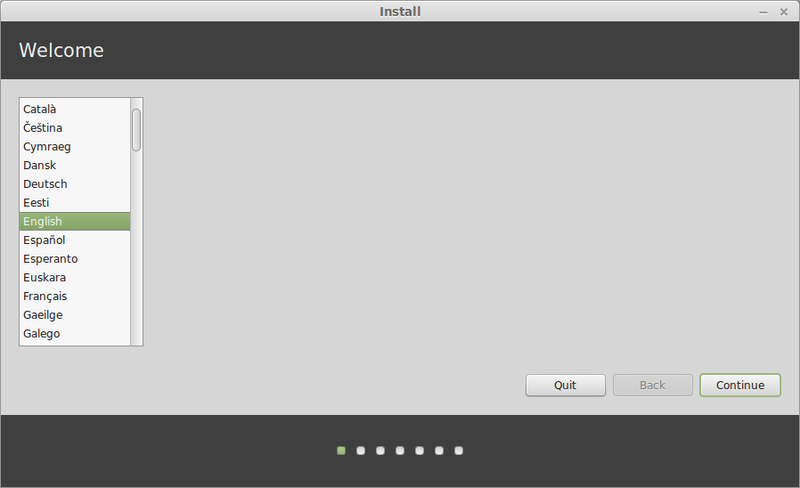 The next screen provides two ways to download Linux Mint. The first way is to use a bittorrent. Many people think that torrents are only used for downloading illegal software but torrent software is just as useful for distributing legal software such as Linux Mint. You can either choose to download from a download mirror or from a torrent. A download mirror will give you the download speed made available by the server that it resides on at that download mirror. A torrent will enable you to download the file from as many people as are serving the software. If there are 100 users with the Linux Mint software available as a torrent then you can download from all 100 people. If you do not know how to use torrents then it might be a good idea to just choose the mirror that is closest to you geographically. 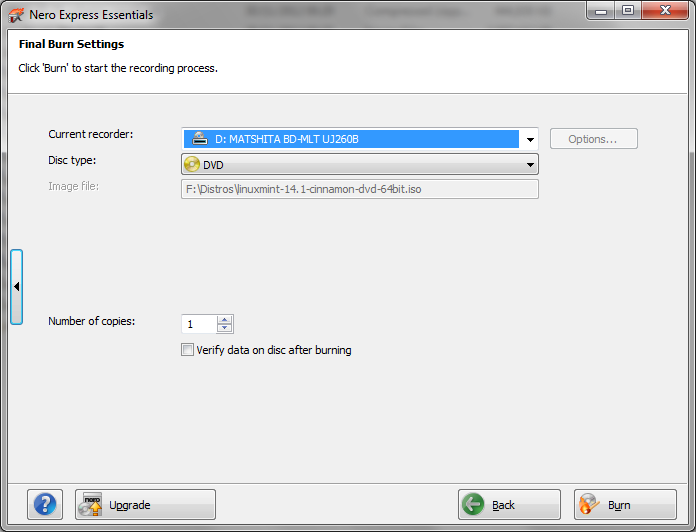 To burn the Linux Mint image to a DVD you will need a CD/DVD disc burning application such as Nero Express. It is highly likely that you will already have a disc burning application on your computer but if not you can download a 15 day trial copy of Nero from http://www.nero.com/enu/downloads/. This guide assumes you are using Nero Express. If you know how to use another application already feel free to use that application to burn the image to a DVD. If you don’t have Nero Express download it from the link above. Open Windows Explorer (Press Windows button on keyboard and E on the keyboard or press “Start” and type “Explorer”, then click “Windows Explorer”). Navigate to the folder where you downloaded the Linux Mint image. Right click the image file with the mouse and select “open with” and then “Nero Express”. Place a DVD into the disc drive. Check that the “Current Recorder” dropdown list is set to your DVD drive. Check that the “disc type” is “DVD”. Check that the “Image File” is the Linux Mint image that you selected. When the process has finished, click the “Next” button and then click the “Close” icon. If you have already created a Linux Mint DVD to boot from then you can skip this section. If you have a USB drive but it is not blank first of all make sure that there is nothing you need on the drive. If there is something you need on the drive copy it to another drive or a disk. IMPORTANT: Remember that if you back up your USB drive to your Windows partition that your backup image will not contain these new files and so if something goes wrong you will lose these files. You should either copy the files to another drive, to a service like Google Drive, Dropbox or to a DVD. Find the removable device that relates to your USB drive. Right click with the mouse on the drive and select “Format”. Make sure the file system is set to “FAT”. A warning will appear telling you that the data on the drive will be deleted. If you want anything on the drive copied off then you should cancel and backup the data otherwise click “OK”. A message will appear telling you that the format is complete. 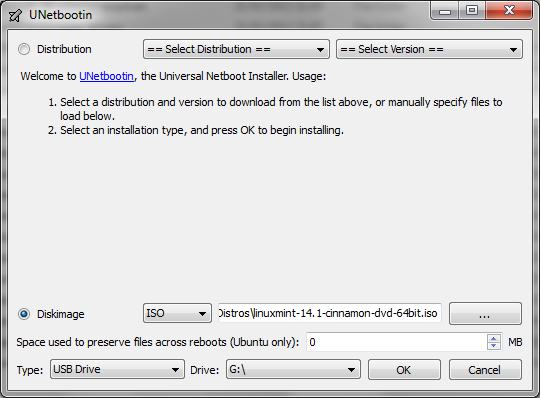 UNetbootin is a free application that enables you to create bootable USB Linux drives. Click the “Download (for windows)” link. The sourceforge downloader will start and UNetbootin should start downloading. If you have a download blocker installed then you may need to authorise the download by clicking the yellow bar at the top of the page and allowing downloads from this site. Run UNetbootin by double clicking on the executable that was downloaded. If you have user account control set to on then you will have to authorise UNetbootin. b. Select an image from your computerI think it is always a good idea to download the image from the place that the distribution links to as you are guaranteed to get the latest version and you can be sure that it is a good image. Click the “Disk Image” radio button. Click the button marker with “…”. Navigate to the folder with the Linux Mint image and select it. Ignore the “Space used to preserve files across reboots (Ubuntu Only)” as this install is for Linux Mint and not Ubuntu. Make sure the “Type” dropdown is set to “USB Drive”. Select the drive letter that corresponds to your USB Drive. Be careful to get this right so that you don’t accidentally overwrite the wrong device. After a while the process will complete and you will have a bootable USB drive with Linux Mint. You may not want to download an image of Linux Mint because you have download limits set by your internet service provider or because you have a poor download speed. You may also prefer to buy a USB drive or DVD as you are then guaranteed to get media that works. Linux Mint runs in Live Mode. What this means is you can test Linux Mint out by running it straight from the DVD or USB drive. You can test all the features to make sure that you can connect to the internet and play music/videos etc. Put the DVD into the DVD drive. A message will appear stating that Linux Mint will boot in 10 seconds. If you press “enter” on the keyboard the boot will start straight away. If everything is ok then after a minute or so Linux Mint will have booted. Put the USB drive into the drive. A menu should appear with options to try Mint or install Mint. Choose the default option which loads Linux Mint from the USB drive without installing anything. If your computer booted straight to Windows 7 then your hard drive is set to boot before a USB drive.If this is the case you have two choices.The first choice is to boot from a DVD and the second is to go into your computer’s BIOS and change the boot order of devices. You will need to read your computer’s manual or search online to determine how to change the BIOS settings as they are different for each make of computer. If you are happy that you have adequately backed up your Windows files and any other important files and you are suitably pleased with the Linux Mint live run then now you can install Linux Mint. Boot into the live version of Linux Mint 17.
connection drops then it is hard to know the state of your installation. power source make sure your battery is charged).Click “Continue”. c. Something elseFor this installation I will be advocating choosing the option “Something Else”. The “Something Else” option allows you to choose how to partition your disks and because of this you can choose how much disk space to give over to the operating system and how much to keep for your own personal data. Look at the image above. This is an image of my disk before I installed Linux Mint. As you can see I have 4 partitions. The partition called “/dev/sda1” is a Windows system partition and should not be touched. The partition called “/dev/sda2” is the actual Windows partition and again should not be touched. When you run the Linux Mint install these are likely to be the only two partitions you see. In my case there are two other partitions. The partition called “/dev/sda3” is a backup partition. I use this to store a system image. It is not the only place I store the system image but it gives me instant access in case something goes wrong. If I happen to lose this partition then I can always go to my external hard drive to restore the image. The fourth partition on my drive is a data partition. I learned a long time ago to separate the operating system from the data on a drive and as such I created a data partition for storing documents, images, photos and videos. What you will also notice if you look at the image above is that there is a lot of free space. Over 100 gigabytes worth. This is the space I managed to retrieve by shrinking the Windows partition and this is where Linux Mint will be installed. At this stage it is important to talk about disk partitions. Each hard disk within a computer can have 4 primary partitions. Windows needs to run off a primary partition. Each primary partition can have logical partitions. Linux can run from logical partitions. If you look at the disk layout on my computer you will have worked out that I already have 4 primary partitions set up. The plan therefore is make logical partitions within the 4th partition. 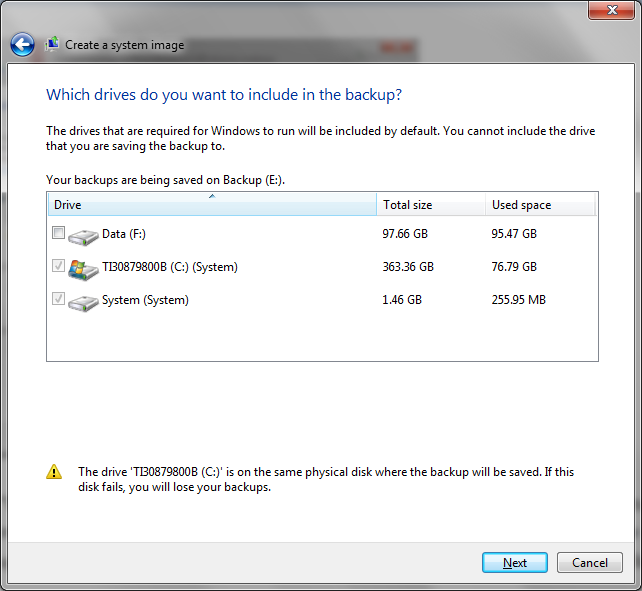 The setup will be as follows: Partitions 1 and 2 are for Windows and are primary partitions. Partition 3 will also be a primary partition and will remain as a backup partition. Partition 4 will be an extended partition and will contain 4 logical partitions. The logical partitions will be the existing data partition, a partition for Linux Mint, a partition for storing data and a swap partition. In your case you might only have 2 primary partitions set up as you may not have the backup or data partitions. This does not matter. You will be creating your logical partitions in the 3rd primary partition. Select the “Free Space” and click “Add”. A screen will appear asking you to create a partition. 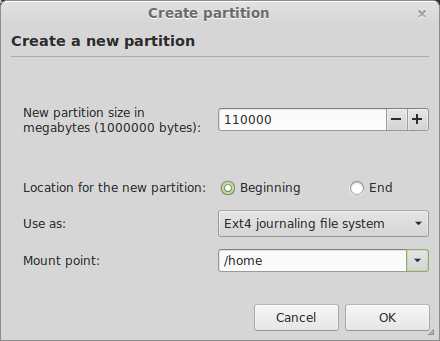 In this step you will create the partition that will be used by Linux Mint. Initially the box marked “New partition size in megabytes” will show the full amount of free space. Realistically you only need around 20 gigabytes for the operating system allowing for software installations and so overwrite this field with 20000. Leave the radio button for “Location for the new partition” as “Beginning”. This will place the Linux Mint partition at the beginning of the disk. The “Use as” dropdown allows you to choose the file system that will be used by Linux Mint. The most commonly used file system in Linux is EXT4 and so I would always recommend using this type of partition. Change the mount point to / to make this the root partition. Now we are going to create the data partition or as it is called in Linux, the home partition. Consider the home partition to be the same as “c:usersusername” in Windows. Select the free space and click the “Add” button again from the “Installation Type” screen. The data partition will use up the rest of the disk space minus the amount you plan to use as a swap partition. How big should your swap size be? Now that is a really good question and everyone has differing opinions. If you plan to hibernate/suspend then consider using at least as much disk space as RAM. In the box marked “New partition size in megabytes” enter a value which is at least the mount of RAM less than the amount of remaining disk space. Again set the “location for the new partition” to “Beginning” and set the “Use as” to “EXT4”. You should set the mount point to “/home”. The final partition to be created is the “Swap” partition. Enter the remaining disk space in the “New partition size in megabytes” box. This time change the “Location for the new partition” to be “End”. Within the “Use as” dropdown select “Swap area”. The “Swap area” is used when your machine has memory hungry tasks. The memory hungry tasks will start using disk space to store and swap memory. This is of course inefficient and if you hear a lot of disk activity when doing simple tasks then it probably means you don’t have enough memory in your machine. 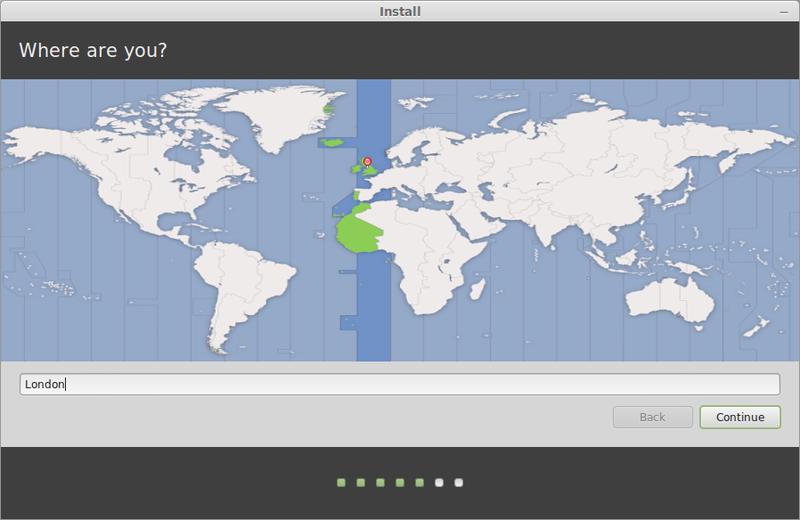 The “Swap area” is used by Linux Mint for hibernation purposes. If you don’t care about hibernation then you can make this partition a lot smaller. Now that all the partitions have been created the last thing to do from the Installation Type screen is to choose where to install the bootloader. This usually defaults to the correct place and should say “/dev/sda”. It is important to make sure this does not have any numbers at the end. (for example /dev/sda2).The bootloader determines the boot order of operating systems. Before booting into Linux Mint for the first time it is worth checking whether the Windows partition is still working properly. To boot into Microsoft Windows reboot your computer (remember to remove your installation media) and a menu will appear with various options including “Linux Mint”, “Linux Mint (Recovery)”, “Windows 7 (sda1)” and “Windows 7 (sda2)”. Press the down arrow until “Windows 7 (sda1)” is highlighted and then press “Enter” on the keyboard. If everything has gone successfully Windows 7 should boot up without any errors. If Windows 7 doesn’t boot up then reboot and try the “Windows 7 (sda2)” option on the menu and press “Enter”. If Windows 7 refuses to load then there is a problem and it is not now worth continuing with booting into Linux Mint until the issues have been resolved. Feel free to leave a comment and I will try and troubleshoot your problem. The worst case scenario would be reverting to the backups you made earlier. if you are reading on it is assumed that you have a working Windows partition. 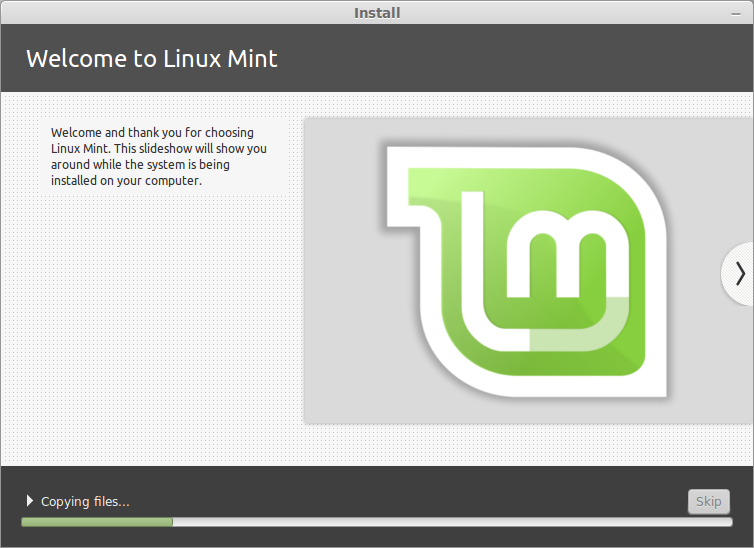 Now it is time to try Linux Mint. Reboot your computer and from the menu press the down arrow until “Linux Mint” is highlighted. Now press “Enter” on the keyboard. After a short period the Linux Mint login screen should load. If you chose not to login automatically then a login screen will appear. You can login by clicking the username at the top of the screen. 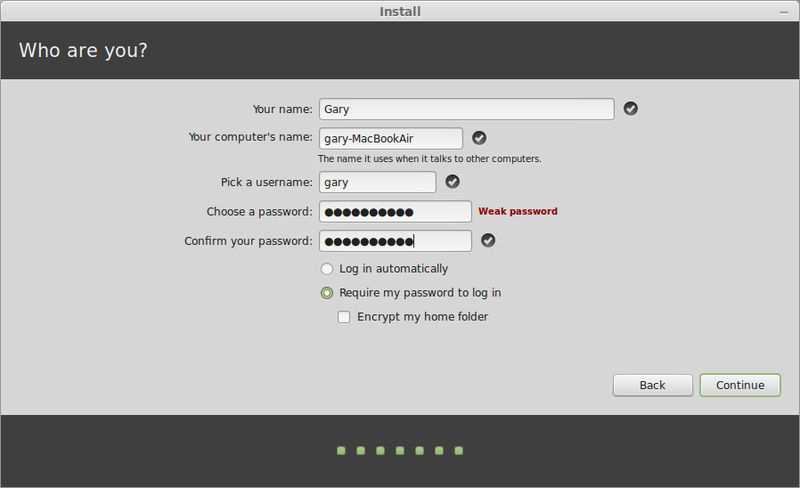 Enter the password that you set up during the installation phase and press “enter” again to login. If all has gone to plan you should now be able to boot into Windows 7 and Linux Mint. I hope you have found this guide useful but if you spot issues along the way please leave a comment so that I can update the guide and so that other people can see how you worked around potential problems. If you found this guide useful consider using one of the share buttons below to share the article so that other potential Linux Mint users will know where to go. Thank you.. This is exactly what I was looking for! Hola.. Eh intentado instlar linuxMInt17 ya casi como 10 veces, lo que quiero es tener dos S.O. Mi disco es de 1 tera cosa que quiero darle a linuxMInt17 300 gb, eh creado y des-fragmentado una unidad en mi caso "L" con 300 gb, el boot lo hago a través de un pendrive hasta ahi perfectamente, abre el instalador y me selecciona idioma y todo eso, el PROBLEMA es que al momento de darle la particion NO ME APARECE LA UNIDAD LIBRE QUE LE ASIGNE, solo me da 100 mb, 75 gb, y 900 gb. ESe es mi problema como puedo hacer para que me reconosca ese espacio libre que quiero usar para linux… necesito su ayuda…..!!! I have installed Linux mint 17 alongside my windows 7. Now the problem is during my restart(booting) time the Windows 7 login option is not seen. How to get my Windows 7 log in menu?? Are you sure you chose to install alongside and not over the top? yes. Now how to get my Windows menu in boot(startup) period??? Load Linux Mint and open a terminal window, type sudo os-prober and press return, then type sudo update-grub. thanks bro. Yesterday, I did update and upgrade and then it worked. This installation process worked out great. The only part that *slowed* me down was choosing 'Logical' or 'Primary' for the partition. 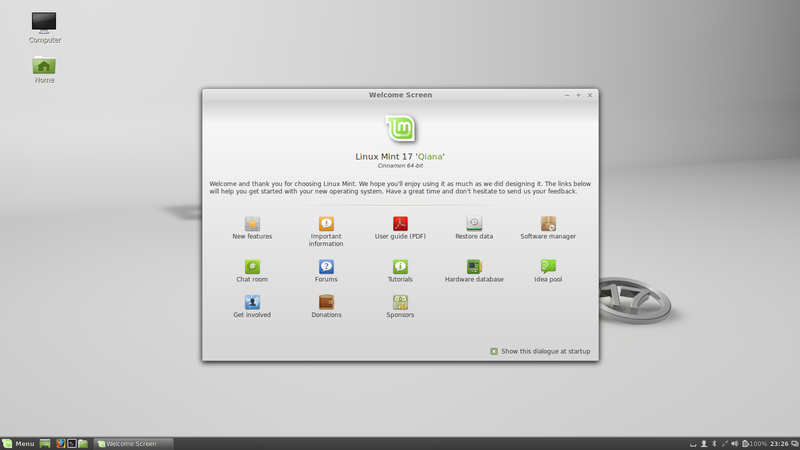 I installed Linux Mint Cinnamon 17 beside Windows 7. The selection defaulted to 'Logical' so I didn't change it. I also read that Linux will recognize either partition. Thank you for your detailed walk-through. Hey, how would you reccomend backing up windows on my laptop without a disk drive, can I do it with a usb? I also only have one Usb though, which I will be using to install mint. Can I upload my system image and repair disk files to a cloud service like google drives temporarily while I install, and if I need them download on another computer and put them on my USB? The first problem is really with shrinking an existing Windows OS disk partition size. There are too many files that Microsoft's defrag application can not deal with. A better approach might be to do a backup and restore under windows prior to installing Linux (sure way to consolidate the Windows files). I would also suggest setting up a second primary NTFS (actually third because Windows 7 uses two primary partitions) for data that you want to access from both operating systems. This partition can be mounted by both OSs automatically. Everything seems to work fine until the reboot. The computer will not boot into windows. Im trying to install Linus Mint 17.1(Rebecca) on my Windows 7 laptop. After booting from pendrive im going to install linux. After clicking something else im not able to see free space as shown in ur guide. in place of tht im seeing windows loader, windows drive (c:) of abt 68 GB and then a SDA4 drive of 431 gb but not free space…also since there is no free space i cant add root, home and swap. If im clicking the sub button (-) then this 431 gb becomes free space and im able to install linux, but in this case windows does not load showing disk error..pl guide..
Well spotted. This tutorial has been up for months and you are the first person to mention that I forgot to add the bit that shows how to make space in the first place. I have updated the guide. 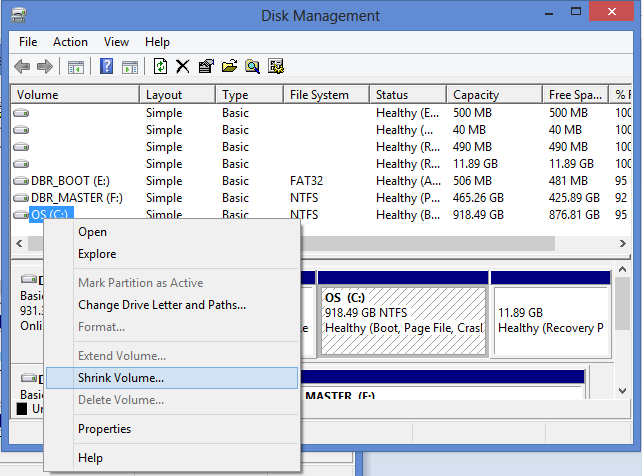 See the section about shrinking your Windows partition to make space. After shrinking volume, space is now unusable when installing Linux. Is there a fix for this? How do I revert this step? How do I make it so I can use the unallocated space I know created? Not very difficult. Please do refer to my other post. You can use either Easus Home Edition or Minitool Partition Wizard to resize the extended partition to include the free space you have created. After you do that the space will be available to you to create necessary Linux file system partitions. I think this step of creating these additional should have been suggested as an exercise in Windows using a third party tool. Believe me they are a whole lot more intuitive. You could simply create these partitions and leave them unformatted. That way the MBR is properly written to. Formatting could be done at the time of actually installing Mint. I installed Linux mint alongside windows7 but it is not showing wifi icon. Even during the installation it did not redirect to connect the wireless network. But Wifi is working in windows7. 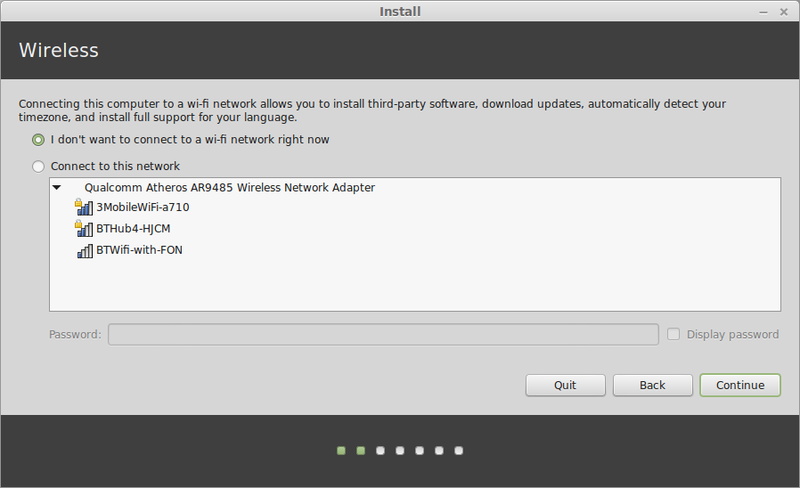 Now how can I connect my system to wifi in Linux mint operating system? I suspect that at step 6 you installed the boot loader to /dev/sda1 or /dev/sda2 etc instead of just /dev/sda. The first is to reinstall Linux Mint and make sure you choose /dev/sda at boot time and the second is to try the boot-repair utility. I think you should have included screenshot of partition structure – Gparted – after Mint installation. Is there any way I can install the boot loader to say PBR of sda2 or sda3 as the case may be in stead of to MBR of sda ? Thanks to my TerabyteUnlimited boot manager I have 5 different versions of Windows installed, each in their own independent and isolated primary partitions. Technically I can have 200 primary partitions ! Hi Gary, thanks for this tutorial. I have installed Mint 17.1 on my hp pavilion g6 running windows 8 in a new partition. But I am not able to bring up grub on boot. Windows 8 starts by default and I need to start boot manager to start grub and use linux. Searched the net but cant find the exact ways to do it. Could you please help me? Unfortunately replacing Windows 8 with Linux Mint requires a different set of steps to Windows 7. Thanks Gery, I see that there are 2 additional steps – boot repair and bootloader fix. But will the commands for boot repair remain same? Yes the boot repair steps remain the same. The first two add a new repository and the last 2 get the latest listings from your repositories and install the boot repair tool. (and of course runs it). I installed linux mint in a notebook with win7. Now the boot loader will not start when I turn on my notebook, win7 loads normally, as do the boot loader menu to start and appear in the choice operating system? I suggest you try booting with Gparted from a USB port and change the active partition. You may get the option of booting Windows from it. You should be able to manually add option to boot Windows. If this fails there is a method of installing EasyBCD in windows that will allow you to add Mint Linux in Windos Boot Manager. I have sent you an email regarding this. Hi Gary. Please mail me the solution too. I have the same problem with my laptop. My email id is Sukezcool@gmail.com. Thanks in advance. Please send me the solution too. My email account is rogertsui0922264996@gmail.com Thanks. Hi there Gary, thank you so much for this very comprehensive guide! After shrinking volume, space is now unusable when installing Linux. Sda1- Recovery, sda2 – Boot, sda3 – windows System and sda4 – my Data. I then have 92gb unallocated. In your guide above, was your fourth partition also a primary? How do you suggest I work with or around this? You said that "Partition 4 will be an extended partition and will contain 4 logical partitions.The logical partitions will be the existing data partition, a partition for Linux Mint, a partition for storing data and a swap partition." Then you go on to say "Select the “Free Space” and click “Add”" which seems to leave a big gap. Could you include a step on HOW to make partition 4 the way you mentioned above? I'm a bit lost as to how to proceed now. (Does this mean that I should put the unallocated space freed by shrinking my (D:) BACK into it? Will separating my Data 'drive' into these 4 logical partitions jeopardise the actual data on it? Please help. I hope I'm not just being daft. I look forward to hearing from you. You could very easily use some freeware like"Easus Home" or "Mini Tool Partition Wizard" under Windows to recover this space by first resizing the extended partition to encompass this space and then either stretch the adjacent logical drive or create a new volume. Generally extending "D:" at the tail end would not damage your data. Extending it at the frond end might be a bit messy. Unless drive letter allotment is critical you might as well just create a new volume. You can then change the drive letter as per your specific requirement. However, the main problem I have is that my machine came with four Primary partitions already set up. Which means there is no extended and I cannot just set one up, thanks to the limit being four. I am stuck as to how to proceed because I don't know how to safely convert one of these into an extended partition. Do you have any suggestions how I can deal with this? I am really syrprised at the structure. Normally the OEMs have only 3 partitions. Sda1 = Boot ( around 100 mb) sda2 = your all in one windows partition and sda3 which would be recovery partition at the tail end of the hard disk. Notwithstanding what Windows identifies ads4 as a primary partition – technically extended partition is also a primary partition – view it in on of the 3rd party application I referred to earlier. That will give you clearer picture. You could convert your sda 4 from a primary partition to extended. It most likely is a question of the identifier in your MBR. Either one of the 2 partitioning applications I referred to can do it. Then you can simply resize this extended partition to include the 92 gb you have at the end and then create the required logical partitions partitions. The data will mist likely show up as sda5 with unused space behind it. Thank you Gary for your wonderful detail directions! I followed them and they worked like a charm! I shrank the Windows partition too much and added to much room to the Linux Mint partition = "Low Disk Space". I figured I could reverse the procedure and take from the Linux partition and add back to the windows partition. When I right click on the Linux partition I'm unable to select "shrink volume". You would have to do this within Linux itself. run GParted and choose your home partition. Click resize partition and make the partition smaller. This wouldn't add the space back to your windows partition but would enable you to turn the empty space into an NTFS partition where you can save Windows files. Another option is to delete the Linux partitions within Windows, right click on the Windows partition and select expand to use the whole disk. Then repeat the guide above and shrink by less than before. I currently have a 32 bit operating system on windows 7 professional, will Linux 64 bit make me able to play 64 bit games? You should have no problems if they are in independent partitions. This holds true for Linux games only. You can't if you are planning to use use wine to play windows games. After burning Linux Mint to the USB drive using UNetbootin and setting the boot order in BIOS, I'm left with a blank black screen with the exception of a _ blinking. What do I do now? You should use YUMI available at pendrivelinux.com. It works perfectly UNLESS you have some exotic graphic chip set that is not recognised by the installer. In fact I use it to create multiboot pendrives that can do a whole lot of maintenance as well varieties of installations including Windows ! when i finish creating the ext4 partition, the free space that was needed to create the swap partition changes and gets the name "useless". So i cant get the ext4 partition but i cant create the swap partition. When i create the ext4 partition, the remaining free space changes its name to "useless space". You should use either Easus Partition Master of MiniTool Partition wizard from within windows to create / resize your required partitions. That is the only way te MBR is going to be written correctly. You should have no problems such as "USELESS PARTITION". I encountered an interesting problem while installing Mint on my laptop alongside Win7. I followed all steps in your guide up until manually partitioning the HDD, as I chose the automatic option. Now, when I restart the machine in Mint, it fails to recognize the on-board keyboard and mouse pad. They function fine when accessing the BIOS and when loading the OS emulator from disc, so I know it isn't a spontaneous hardware failure. What do you suggest as my next step? Can you please email me at valerie.skuban@gmail.com? Thank you. Hi Valerie. That is a strange issue. Not one that I have encountered. Can I ask whether you are using a laptop computer or a desktop? What you might want to try is once Mint has loaded attach a USB mouse ant see if it works. If it is recognised and gives you access to your laptop then you will be able to go into the hardware part and install proper drivers. Mint does not always install ALL the drivers especially ones that are proprietary and need to be installed by the end user. I have had similar problems with nVidia and S3 graphic drivers. I always keep Super Grub disk handy. Whenever my laptop fails to boot after installation of new OS,I use SGD to boot into new OS and restore the Grub to mbr and execute grub update command and reboot. I get good grub menu having options for windows Ubuntu or any other installed OS. i am looking for the Windows 10 Activation Keys is this available? I've bought a machine that comes with only DOS. I plan to install Linux Mint right away. I will install Windows 10 later on if needed. How should I create the partitions now so that Windows can be installed easily later? Thanks. "The “Use as” dropdown allows you to choose the file system that will be used by Linux Mint. The most commonly used file system in Linux is EXT4 and so I would always recommend using this type of partition. Change the mount point to / to make this the root partition." The above bit within quotes in not clear. In the drop down list, there is no "root" to select. Can u please explain this bit. Every other thing worked perfectly well and I found this very helpful. Awaiting your reply on my query please. Thanks in advance. thanks very much for your explanations, they are very clear and detailed, if any issue i'll let you know. thanks again from Chile! Southamerica. The Linux mint install tells me I don't have an os installed on my computer so the option to install alongside windows is not offered. How do I get the install to recognize there is in fact an os installed? Thankyou. Will it also work if I just click Install alongside windows? are ther any ways to recover lost files & partitions???? The easiest way that I have found to install Windows and Linux without using a third party boot manager is to have one more application handy, namely gParted. I go about by following these steps. Boot with gparted cd / usb drive. 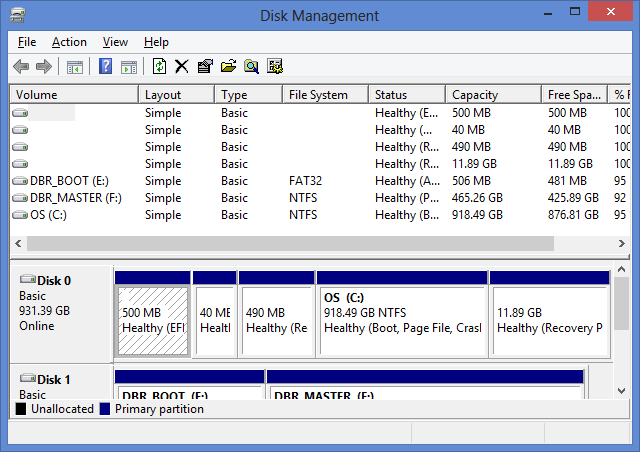 Create 2 primary partitions of appropriate sizes to suit Windows and Linux installation. Format the first one with NTFS and the second one with Linux file system of your choice, ext2, ext3 whatever. Create an extended partition with 1st volume twice the size of and format it for Linux swap. Create additional volume/s – size is yopur choice – with Linux file system if you want defferent partition for Linux data and others with NTFS. Mark the first volume as active and bootable. Reboot with Windows CD/DVD and go through the installation process. Boot with gparted cd / usb and mark the second partition as active. Now boot with your Linux installation media. It should automatically detect your windows installation and add it to the boot menu. It is easier to windows to Linux boot menu then to add Linux to Windows boot menu. Thank you very much for your complete guidance!! I went through tons of websites looking for this step by step guide in vain but you got it! Thanks again. "It is easier "add" to windows to Linux boot menu then to add Linux to Windows boot menu." Missed one word. Another note. While installing Linux make sure you select the correct partition in place of the entire disc as so many versions do. I have a very old Nvidia graphics card which didn't work when I booted Mint from CD. An "X Server Failed" message appeared. I also found a "Failed to load module nvidia" message. The get around is to press any key during the boot countdown and select compatability mode. Then install and boot from disk, again using compatability mode. Then use the update manager to install all updates. Then use the driver manager to select the recommended driver for your card. The other issue I encountered was during partitioning. I tried to partition "/home" on a different physical disk to "/" and swap. I kept getting an "X ??? ???" message. All sorted by partitioning everything on the same drive. I only had 20GB to spare on my SSD, but with 16GB root and 2GB each for home and swap it all worked. Hi Gary. My linux installer is a bit differnt. I don't have the option- "Install Linux Mint alongside Win 7" .Also when tried to follow the option "Something else" , "free space" is not shown. There are sda1, sda2, sda,3, sda4 and "unusable" . I don't know how "unusable" showed up. I shrank the OS drive just like you proposed. The shrink utility tool proposed a space by default like you said. The "unusable" is having a size of 69161 MB !!! Please help !! You can have only 4 primary partitions on a hard drive. So sda 1 tp sda4 is all you can have. Any space between or beyond these partitions would appear as "unusable". Normally one creates 3 primary partitions and the forth one is extended one that can contain volumes. If your sda4 is of this type you can re-size it to include the "unusable" portion of the drive. The best way to manage your partitions is to use the latest version of bootable gparted and prepare the partitions as described before. Once thisis done you should be able to install it in any one of the described locations. At the immediate step following the "Something else" option I have a box showing /dev/sda with no information in any of the fields for type/mount point/format etc, and then the free space underneath showing as 160041 MB. The graphical type bar along the top of this does not show any different coloured parts for the partitions at all. The drive is, obviously, a 160 Gb partitioned as a NTFS partition containing Win 7 of 75Gb, an empty FAT32 partition of approx 70 GB with the small amount remaining unallocated. I intend to use the empty 70 Gb for the Mint installation. Any suggestions would be helpful thanks. I would very strongly suggest that you use bootable gParted disk to create your partitions. And before you do anything with your working hard disk lay your hands on a spare disk and experiment. From the question it appears you are not familiar with how the partitions are created , labelled and assigned drive numbers / names. Does installing linuxmint on an external hdd with the install alongside windows option make the hard drive unusable in windows ie. cannot access files on the external hdd? It depends entirely how you partition this external drive. 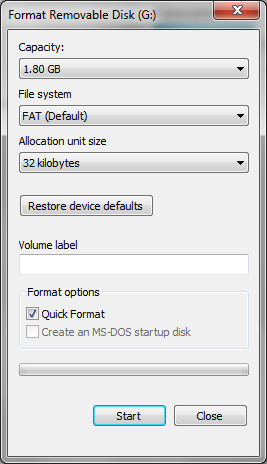 Any fat / Fat32 or NTFS partitions will be read by Windows natively. Any EFS 2,3 or 4 can be read – write accessed from windows with proper mounting app which are available freely on the internet. Just have to search for it. What you will not be able access is the Linux swap partition. i have been trying this for 2 weeks now to no avail. i can get linux to install to an empty hard drive and it shows all files, but it absolutely will not boot, just default boots to windows 7. i have run the boot repair option from the live cd and then windows wont boot. i have never got the screen to show me which operating system to boot from. i even downloaded easy bcd and it still wont boot, just gives me a flashing cursor. anyone have any ideas? i really want to try linux out. I'm about to attempt an install of Mint along side an existing Win7 installation. 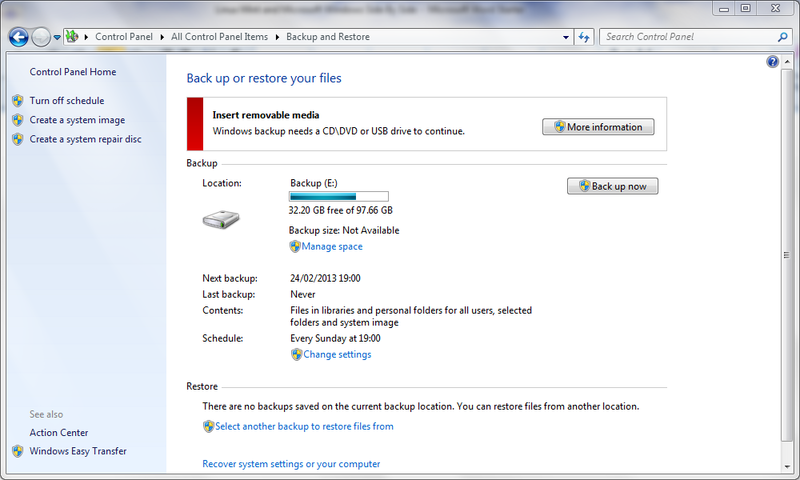 Currently my disk as three primary partitions: 'system' 'recovery' and 'windows'. I guess that I've got to leave this factory layout and make an extended partition for data, mint, swap, and for local backup care of acronis and to hold my windows image as a quick restore; that's a total of 4 logical partitions. I'm a first timer at Linux and would appreciate any comments on this scheme. If you want to leave that layout, maybe you must let the installer take care of the partitioning job…by selecting the first option in the partition menu, i mean choosing "Install Linux alongside Windows and preserve your files…bla, bla…. I have a complex hard disk layout similar to your illustration, but with an Acronis secure zone for backups. When I made the layout I allocated a partition for Linux Mint and a small swap partition. Do I simply install linux mint to the partition I've already allocated (it is NTFS), or do I reformat it (and the swap partition)? I've installed Acronis OS selector, so should not have boot selection issues, but wonder about the boot loader, do I still need to install that on the physical hard disk? While installing Linux you should get the option of selecting the partition for main installation and swap partition. You can at that time let if format these partitions as even if it may allow read / write on NTFS it won't be usable for Linux installation. Let it format to Linux native format of your choice like ext2 / 3 or whatever. Hello, I followed the instructions above about a week ago and the installation went flawlessly. Thanks. BUT, if I now decided I need a larger partition for my Linux applications, is there a way to do that or do I have to delete the Linux partitions and start over from the beginning?